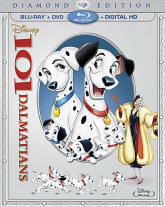 Dalmatians Pongo and Perdita race to save their puppies from the clutches of Cruella De Vil, a villainess who desires a fur coat made from the adorable pups. A gruesome concept that's wildly entertaining in the hands of Walt Disney. Restored and presented on Blu-ray (DVD and Digital HD versions included) for the first time, "101 Dalmatians" has never looked better. While the video may not be a huge improvement over the past DVD releases to warrant upgrading, there is at least one new bonus feature that is worth seeing: "The Further Adventures of Thunderbolt". This delightful, but brief, animated black-and-white short follows the puppies' favorite television dog as he faces danger. There's also a conversation with a Disney animation team in a segment called "Lucky Dogs" and a fun facts piece titled "Dalmatians 101". An episode of Walt's television series, "The Best Doggoned Dog in the World" is also included. Trailers, featurettes, deleted and abandoned songs and a music video are among the extras retained from past DVD releases of the film. One note of concern: this restoration is presented in the aspect ratio of 1.33:1. The original 1961 exhibitor press book suggests that this is the proper ratio for projection of this movie. If the theatrical aspect ratio of 1.75:1 (widescreen) is used, the top and bottom of the picture will be lost. While your flat-screen tv might not be filled, less is better. If the black bars are worrisome, DisneyView (which replaces those bars with artwork) is included in this edition. Once again, Disney delivers a fantastic Blu-ray of an animated classic. It's spot-on perfect.